Trying to convert videos to the right format can be difficult, and you’ll not only need to understand the different containers and codecs that are out there – but also be familiar with the types of formats different devices and platforms support. That is why having a tool like Movavi Video Converter can be useful, as it will help make things much smoother. In a nutshell Movavi Video Converter was designed to simplify video conversion by making it easier and more user-friendly. It has a clean user interface and a streamlined approach so all you need to do is add your video, pick a format, and click a single button to convert it. To make converting videos even easier, Movavi Video Converter also includes hundreds of built-in presets for different devices and platforms. When you select one of its presets, it will automatically use the best format and video settings for that device or platform – so you don’t need to be familiar with the technical aspects of video formats. While the fact that it is quick, simple and easy to use is definitely the main draw of Movavi Video Converter – the other big reason you should consider using it is that it is far more than just a ‘video’ converter. In fact as you’ll soon see it has numerous other features that expand its capabilities far beyond what you’d normally expect. Convert the format of audio files and images. Compress videos down to a specific file size by automatically adjusting the bitrate to match it. Resize videos and images by a percentage, to a specific set of dimensions, or to fit into a particular frame. Extract and save audio tracks from videos. Grab screenshot ‘stills’ of video frames. 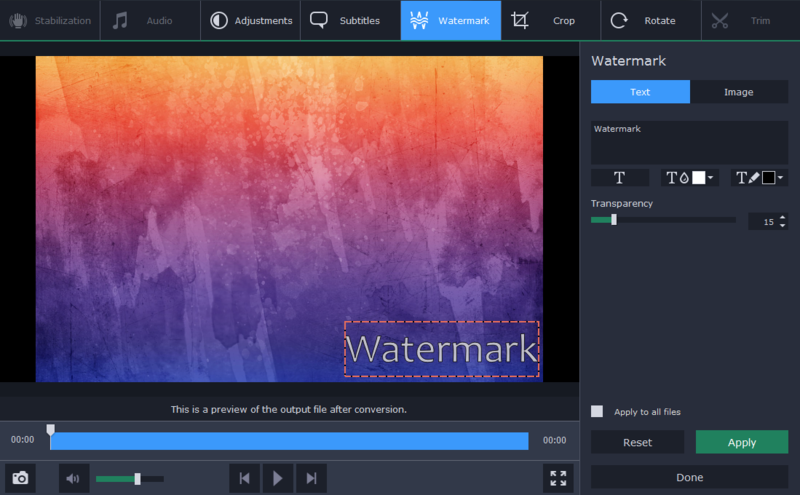 Enhance the quality of videos and images manually or automatically. Cut and trim out any unwanted parts from videos. Crop or rotate the frame of videos or images. Insert customizable text elements into videos. Having all these features in a converter video will definitely expand your options, and allow you to not only convert videos so that they are compatible – but optimize, prepare, and improve them too. All in all its comprehensive features make Movavi Video Converter more of an all-round media converter and utility that is useful to have around. Regardless of whether you want to be able to quickly convert videos from one format to another without any hassle, or would like to prepare and improve your media files in other ways – Movavi Video Converter will deliver exactly what you need. Its interface, approach, and features all make it a unique software that stands out from anything else you may have tried up to this point.